Your use and access to this website is subject to the following terms and conditions and all applicable laws. By viewing or using this website you agree to be bound by these terms, conditions and laws. You may browse this website for personal entertainment and information only. Horses and Horse Information.com grants to you a non-exclusive license (terminable by either you or Horses and Horse Information.com at any time) to download one copy of this website on a single computer for your non-commercial or personal use only. Except as provided in the previous sentence, you may not use, distribute, modify, transmit, revise, reverse engineer, republish, post or create derivative works of the contents of this website without Horses and Horse Information.com's prior written permission. 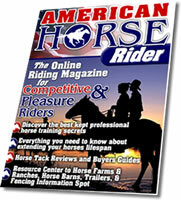 THE CONTENTS ON THIS WEBSITE ARE PROVIDED "AS IS"; Horses and Horse Information.com MAKES NO WARRANTIES OR REPRESENTATIONS, WHATSOEVER, EXPRESS OR IMPLIED, IN CONNECTION WITH THE CONTENTS OF THIS WEBSITE, YOUR USE OF THIS WEBSITE, OR YOUR USE OR THE CONTENTS OF ANY WEBSITE LINKED TO THIS WEBSITE. WITHOUT LIMITING THE FOREGOING, Horses and Horse Information.com MAKES NO REPRESENTATION REGARDING THE ACCURACY OR COMPLETENESS OF THE CONTENTS ON THIS WEBSITE. THE FOREGOING EXCLUSIONS MAY NOT APPLY TO YOU TO THE EXTENT THAT APPLICABLE LAW PROHIBITS THE EXCLUSION OF IMPLIED WARRANTIES. Horses and Horse Information.com, ITS AFFILIATES AND ANY DIRECTORS, OFFICERS, EMPLOYEES, AGENTS, CONTRACTORS, SUBCONTRACTORS OR AGENTS OF THE FOREGOING SHALL NOT, UNDER ANY CIRCUMSTANCES, BE LIABLE FOR CONSEQUENTIAL, INCIDENTAL, INDIRECT OR SPECIAL DAMAGES, RESULTING FROM THE USE OR INABILITY OF USE OF ANY CONTENTS ON THIS WEBSITE (OR A WEBSITE LINKED TO THIS WEBSITE), EVEN IF CAUSED BY Horses and Horse Information.com's OR ITS AFFILIATE'S NEGLIGENCE OR IF Horses and Horse Information.com OR ITS AUTHORIZED REPRESENTATIVE HAS BEEN APPRISED OF THE LIKELIHOOD OF SUCH DAMAGES OCCURRING, OR BOTH. THE ABOVE LIMITATION OR EXCLUSION MAY NOT APPLY TO YOU TO THE EXTENT THAT APPLICABLE LAW PROHIBITS THE LIMITATION OR EXCLUSION OF LIABILITY FOR INCIDENTAL OR CONSEQUENTIAL DAMAGES. Horses and Horse Information.com's TOTAL LIABILITY TO YOU HEREUNDER SHALL NOT EXCEED YOUR ONLINE CHARGES FOR ACCESSING THIS WEBSITE. Any communication or material you post or transmit to Horses and Horse Information.com is, and will be treated as, non-confidential and non-proprietary. By transmitting or posting any communication or material to this website you agree that Horses and Horse Information.com or any of its affiliates may use, including without limitation, reproduce, transmit, publish, broadcast or post, your communication for any purpose. You agree not to post or transmit any unlawful, threatening, libelous, defamatory, obscene, pornographic or profane material or any material that constitutes or encourages criminal conduct or that violates any law. Unless otherwise noted in the contents of this website, all names, logos and marks appearing in this website are trademarks owned or used under license by Horses and Horse Information.com or its affiliates. Other trademarks are the property of the respective trademark's owner. Unauthorized use of any trademark or content on this website is strictly prohibited. Horses and Horse Information.com makes no representations that the contents in this website will be available or appropriate in every jurisdiction in which this website may be accessed. You are responsible for compliance with any laws governing use of a website. United States export laws prohibit downloading, exporting or re-exporting certain types of software (a) into (or to a national of or resident of) any country to which the U.S. has placed an embargo, including without limitation, Afghanistan, Cuba, Iran, Iraq, Libya, North Korea, or Syria; (b) to any one on the U.S. Treasury Department's Specially Designated Nationals list, or (c) the U.S. Commerce Department's Table of Denial Orders; provided further that if you download or use Material from this website, you represent and warrant that you are not a national or a resident of any such country under embargo by the United States nor a member of any such list or table.